Delivering quilts to the American Red Cross for disaster relief. Quilting is an expression of us, our love of color, art and design. It is therapy for the soul and brings friends into our lives. For me, quilting is as relaxing as swimming and as therapeutic as fine wine. Quilting brings joy to my life, and I love spreading that joy to others. I see that joy when a fellow quilter unfolds her quilted top and sees the stitches that add depth and dimension to her creation. I see that joy when a Memory Quilt arrives in the hands of the person whose memories are captured in the T-shirts and clothing that create a beautiful keepsake. But I also enjoy spreading the comfort of quilts to people who might not otherwise enjoy them. 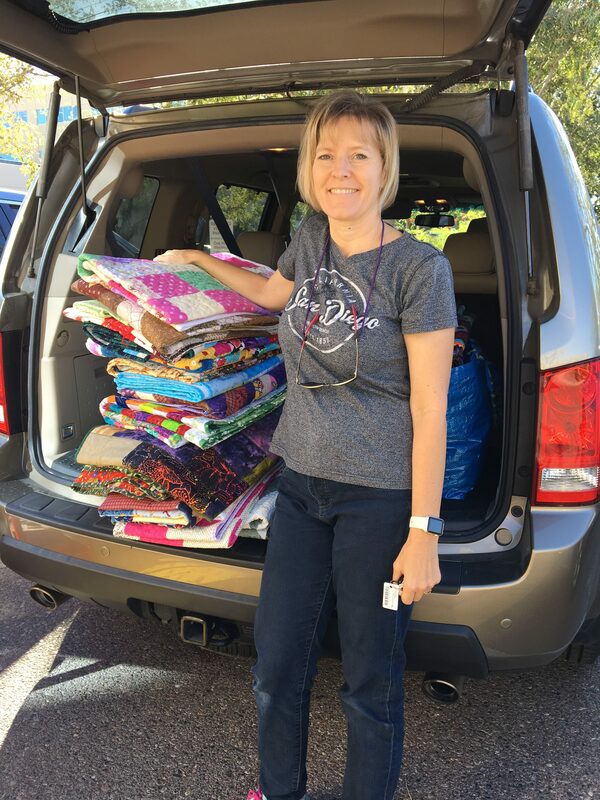 Through Nimble Thimbles, my local chapter of the Arizona Quilt Guild, we give away more than 100 quilts every year to local philanthropies, including the American Legion and American Red Cross. These quilts touch people in ways I can only imagine, letting people know they are cared for on a very fundamental level. My sewing life started before my quilting life. I began my sewing all of the curtains for my home because I couldn't find just what I wanted in the quality I wanted. Then my daughters were born and I started sewing sweet little girl outfits and extravagant costumes. Then I discovered quilting and before I knew it, I had a new quilt on every bed in my house. I soon became enamored with long-arm quilting and the beautiful digitized patterns available to owners of computerized machines. The options were endless and wonderfully creative. In 2013, a Gammill Statler Stitcher named Grace made her way into my life and home. She and I have had a lot of fun together. 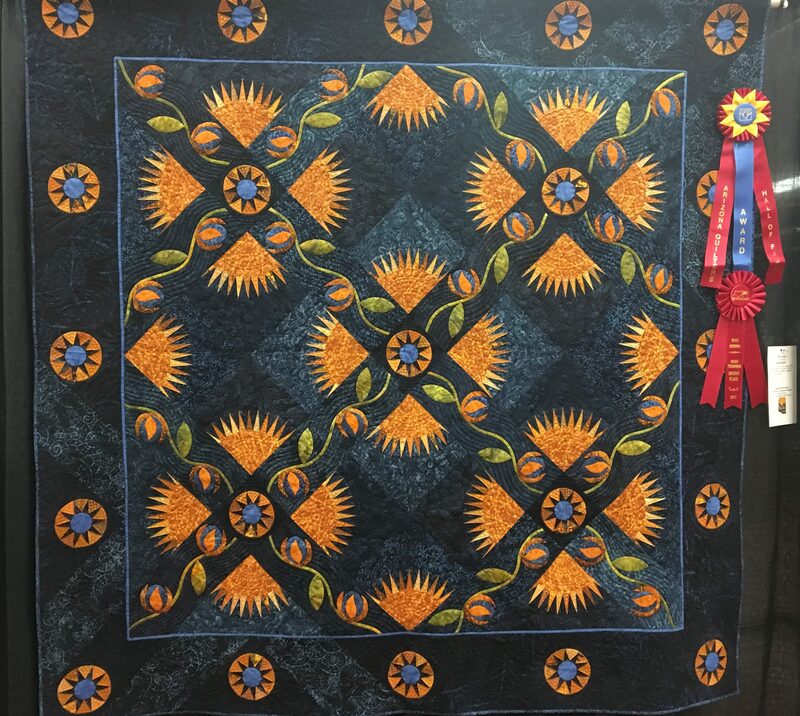 This year, we watched two quilts we quilted earn awards at the Arizona Quilt Guild show -- Midnight Garden by Kathy O'Brien earned a Second Place award in mixed technique as well as Hall of Fame. And Judy Locke's Vintage Compass won an Honorable Mention and Exemplary Machine Quilting.